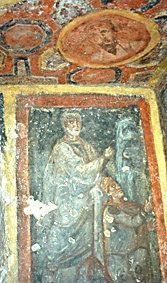 L’Osservatore Romano is reporting that last Friday the oldest known icon of St. Paul was recently discovered in the catacombs of St. Thecla, which is located on the Via Ostiensis. The image apparently dates to the fourth century. It was discovered during a restoration project. 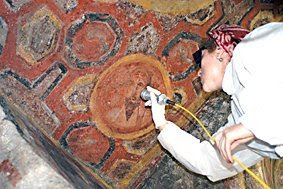 ROME (Reuters) - Vatican archaeologists using laser technology have discovered what they believe is the oldest image in existence of St Paul the Apostle, dating from the late 4th century, on the walls of catacomb beneath Rome. 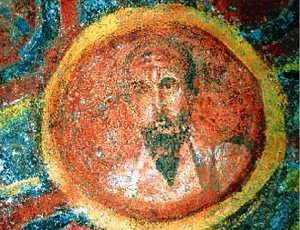 Experts of the Ponitifical Commission for Sacred Archaeology made the discovery on June 19 in the Catacomb of Santa Tecla in Rome and describe it as the "oldest icon in history dedicated to the cult of the Apostle," according to the Vatican newspaper. Here are some of the amazing pictures that have been released. I am surprised that this is the oldest icon found of Paul. 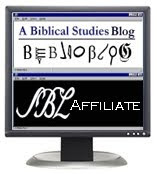 I assumed we had images from the third century. This is certainly an interesting find.